First Look At Tom Holland As Spider-Man Revealed? On the heels of the report earlier today that claimed Spidey’s new-fangled suit would be “Avengers-friendly,” a new, wholly unconfirmed screenshot is doing the rounds online the appears to showcase our first look at Tom Holland as Marvel’s new Spider-Man. The blurry image was allegedly lifted from a leaked copy of the Captain America: Civil War footage headed to Disney’s D23 convention later this week. As Joe and Anthony Russo’s threequel is set to be Holland’s first appearance as Peter Parker’s alter-ego, the notion that this is indeed a genuine still from the trailer is certainly plausible, though we’d advise treating the photo with a degree of skepticism before the sizzle reel is released in earnest. Yes, the shot is taken from an angle that is instantly recognizable to fans of the webcrawler, as he scurries up a skyscraper in New York City. 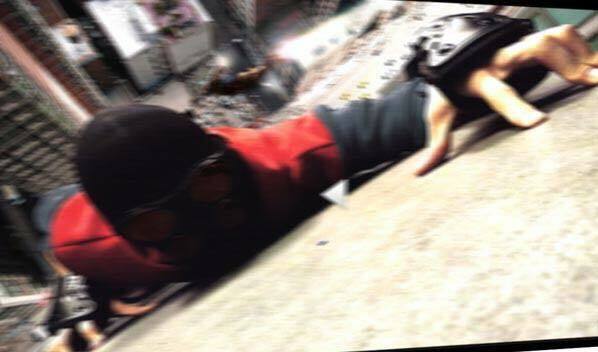 However, the fact that the photo sees Spider-Man concealed by a rudimentary mask means that such a still image is relatively easy to manipulate. Then again, if Civil War will indeed introduce Holland’s character as a much younger Peter Parker, then it’s logical that our friendly neighborhood Spidey would go through various iterations of the suit before getting to grips with the classic red and blue guise we know and love. Furthermore, if the Russo brothers adhere to the comics thread, it’s likely we’ll see Spider-Man don the Iron Spider Armor either during Civil War or for the 2017 standalone feature. With a new suit and actor in tow, Tom Holland will set into the shoes of Marvel’s younger, wet-behind-the-ears Spider-Man for the Russo brothers’ Civil War on May 6, 2016. Directed by Anthony & Joe Russo from a screenplay by Christopher Markus & Stephen McFeely, Captain America: Civil War picks up where Avengers: Age of Ultron left off, as Steve Rogers (Chris Evans) leads the new team of Avengers in their continued efforts to safeguard humanity. After another international incident involving the Avengers results in collateral damage, political pressure mounts to install a system of accountability and a governing body to determine when to enlist the services of the team. The new status quo fractures the Avengers while they try to protect the world from a new and nefarious villain.